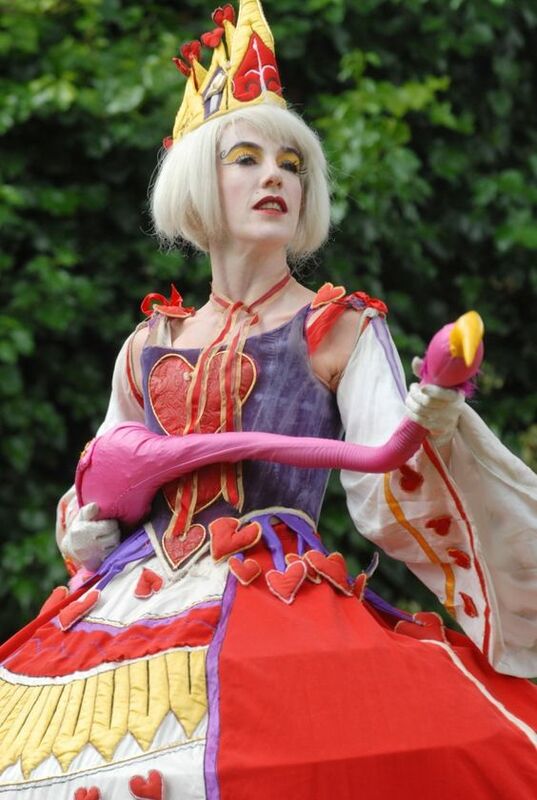 This show based on Lewis Carroll’s Alice’s Adventures in Wonderland, intends to turn the event area into a magical Wonderland by presenting scenes adapted from the book. 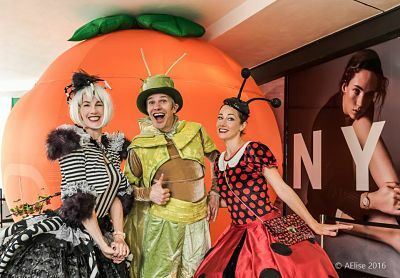 Most of the scenes are interactive walkabout performance that passers-by can get involved in, giving them the experience of being on their own adventure in Wonderland. 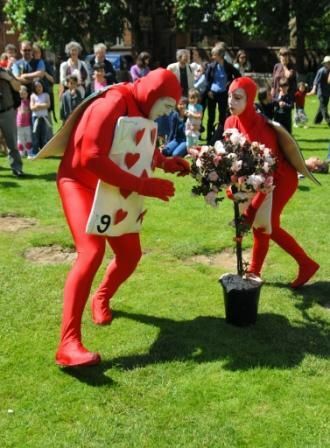 There is also a high level of physical skill, strong costume and slapstick humour to keep people entertained. Come and meet some of the characters, in a scene by scene breakdown of the show! 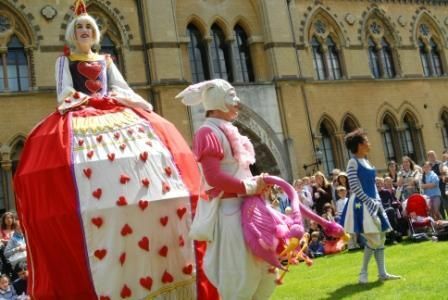 Either on stilts, roller skates or on foot, this is a walkabout sketch that often involves a crowd of children being enlisted by Alice to help find the White Rabbit. A big game of hide and seek. 20mins runabout. This scene is part walkabout and part static show. The Tea-Party crew (Mad hatter, March Hare, Dormouse and walking Table) start several tea parties each one interrupted by the Table who gets bored and runs off. Eventually they meet Alice and a scene ensues. The static scene is full of acrobatics and acrobalance routines and can be performed to its own musical soundtrack. 30mins inc 5mins static. 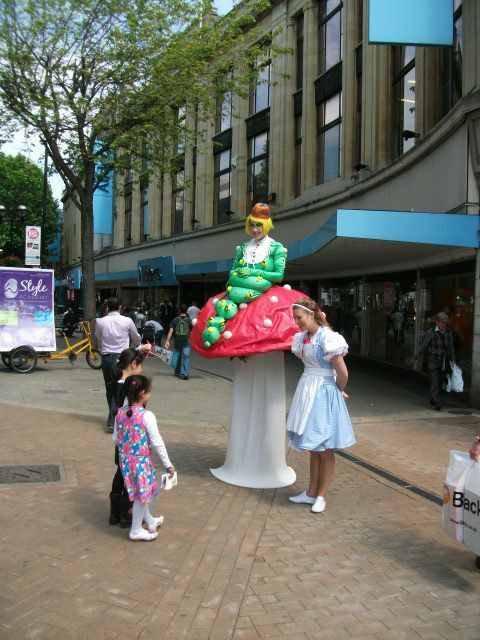 The Caterpillar (on a mushroom on stilts) installs himself in some suitable location and waxes lyrical to all and sundry (including Alice who is now on foot to make the caterpillar appear bigger). He is a fantastic and ridiculous sight and has been known to introduce bands on stage and perform other MC duties. He does like the sound of his own voice though so usually needs to be removed. We do not recommend taking his advice too literally. 15-20mins static. Where possible, we rig a trapeze onto a tree or beam, or otherwise find a suitable elevated spot for the Cheshire Cat to sit. In a similar fashion to the Caterpillar scene and usually at the same time, passers-by and Alice are given unhelpful directions by the Cat. If rigging is possible the Cat also performs a routine. 20 mins static. 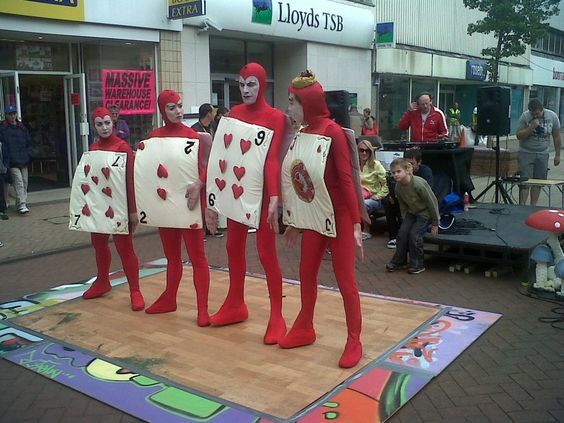 Six cards perform slapstick acrobalance and marching routines. The language of card games is used. 30 mins walkabout. This is a big, colourful, noisy scene. 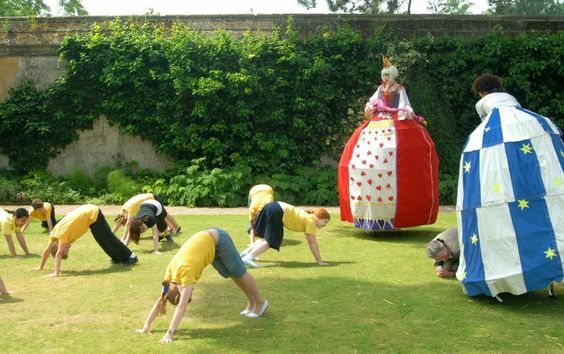 The Queen, her entourage and Alice play croquet enlisting members of the audience as both hoops and hedgehogs with The White Rabbit as the umpire. The beauty of this scene is the freedom given by improvisation. 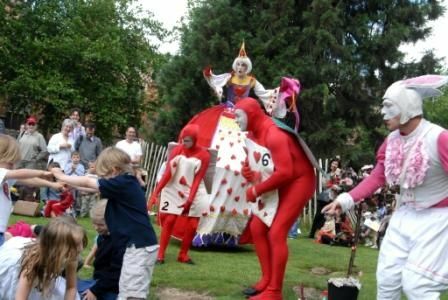 Most commonly it becomes an invitation for the audience to join in the chaos that is Wonderland as The Queen and Alice battle to the last for victory (the Queen always wins of course). This has led us into all sorts of situations from playing with a real team of croquet players to dancing on stage with a rock band. As long as The Queen receives her well-deserved ‘BOOOO’s we are happy. This show works equally well at a party, on the street or at a festival. 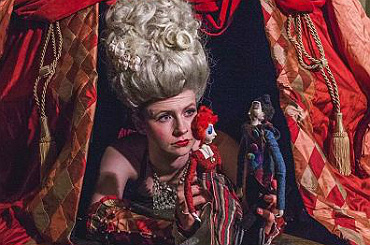 The performers are so familiar with the material that they have become extremely flexible with the structure of the scenes and can adapt to brief. Examples of previous adaptions include putting various characters on aerial equipment, working around a maze and making a whole hour long staged version. Standard Length of Performance: 4 x 30-45 minutes for 5-man show. We simply need a large, clean, well-lit dressing room with a table and chairs for make-up and reasonable access to the performing area. Please enquire about requirements for aerial if required. Risk assessments are also available on request. We do not work in rain, snow or high wind.